John Ailes, Rear Adm., USN, (Ret.) is a native of New London, Conn. He is a 1985 graduate of Oregon State University with a Bachelor of Science degree in Computer Science and he holds a Master of Science Degree in Electrical Engineering from the Naval Postgraduate School. 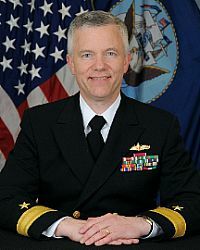 Prior to retirement, he last served as the as deputy commander, Fleet Readiness Directorate, Space and Naval Warfare Systems Command in March 2016. His sea tours include Strike Warfare/Communications Officer, USS Bunker Hill (CG-52); Combat Systems Officer, USS Elliot (DD-967); Combat Systems Officer, USS Russell (DDG-59) and Executive Officer, USS Lake Erie (CG-70). Ailes was the commissioning Commanding Officer, USS Chafee (DDG-90). Dawn Cutler, Rear Adm, USN, (Ret.) is a native of Portland, Oregon. She is a 1989 graduate of Oregon State University, where she received a Bachelor of Science degree in Business Administration. She holds a Master of Arts degree in National Security and Strategic Studies from the Naval War College. Prior to retirement, she last served as the U.S. Navy’s Chief of Information. Cutler is the principal spokeswoman for the Department of the Navy and provides strategic counsel to the Secretary of the Navy and the Chief of Naval Operations. She lead the Navy’s public affairs community consisting of more than 2,500 active and reserve officer, enlisted and civilian communication professionals. accepted for lateral transfer to the Public Affairs community. executive assistant and the deputy Chief of Information. awards), and Navy and Marine Corps Achievement Medal (2 awards).